We release our first social game “The Great Jitters: Haunted Hunt”. Pac Man is so yesterday! With our new game „The Great Jitters: Haunted Hunt“ we eventually dive into the universe of Facebook apps. The social game is as a co-branding between kunst-stoff and the YPS magazine and is available for all Facebook users since Thursday 11th of October. 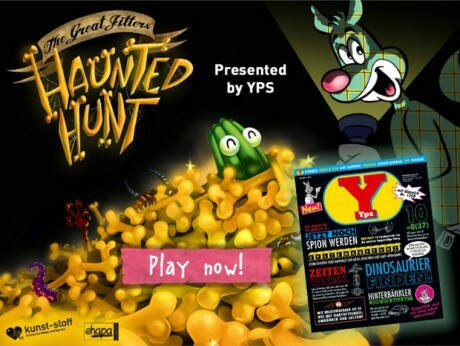 Together with the famous German cultural figure, the YPS kangaroo, J. Jitters will accompany the player on his fast trip through the maze of rails. This one has to play against time, against his friends and has to do small quests under time pressure. “Haunted Hunt” is a crazy and addicting social game, just right in time for Halloween. Happy 1. Birthday J. Jitters! Today our action-puzzle game “The Great Jitters: Pudding Panic” gets one year old! To celebrate our favourite piece of pudding J. Jitters’ birthday, kunst-stoff pays a round for all gamers, and offers the game for free from the 7th to the 10th June for iPhone, iPad and Mac! With a classical German (ok, Swiss) cream cake, candles and coffee (“Kein Bier vor Vier”) the team celebrated his little green game character. Hell, this cake is huge. But please don’t eat me – everything that has eyes also has a soul (and I have big eyes!). Hard to believe that one year ago he was just a rough sketch on paper and that his existence could have been placed in jeopardy by a potato – the first idea for a main character in the puzzle game. 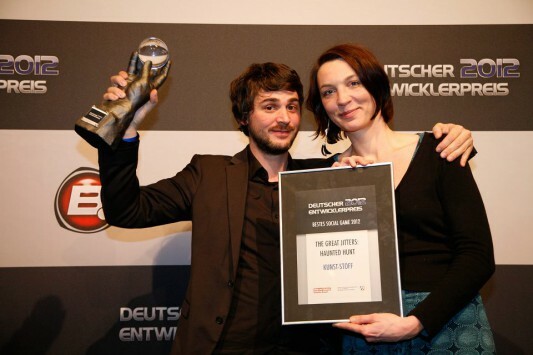 Now we look proudly at our jittering Jitters: The game won many awards, like the Red Dot Design Award 2011, the German Developer Award 2011 and the German Computer Game Award 2012. I have a cake, a nice smiling boss and a poster of myself. I HAVE IT ALL! Even one year older (and wiser), the jelly lost none of its courage and still seeks his thrill in the ghost train. So get the game, scare the monsters and save the pudding! Enough party, I have some business in a ghost trains to do. „The Great Jitters: Pudding Panic“ wins German Video Game Award! Our pudding is winner of the award in the category “Best Children’s Game”. We are happy and proud and want to thank the jury, the award administrators and, of course, our whole team, and, last but not least,our players, supporters and fans! Special thanks to J. Jitters, our brave protagonist! The Great Jitters: Pudding Panic now available for LINUX! So it is! Get the game on Desura here!